Hello from the beach! I flew the coup this weekend to meet a few friends for a much needed winter reprieve. (Ahem, East Coast folks I can see you rolling your eyes over there about my our SF “winters” but lissennnnn - these week long gray-outs are depressing as hell, and I’m a plant that needs sunshine to survive.) At any rate, our Super Extra Thotiana Adult Spring Break 2019 is in full effect and could not have come a single moment too soon. Whew, the past couple of weeks have really tested me. At times I even doubted whether I would make it through the three day week with my sanity in tact (cue the tiniest violin). But the combination of beta blockers and the promise of this trip kept me in the game and off the ledge. I even managed get my work done, be nice to my husband, and cook a couple meals. Wauw. I’d be lying if I didn’t say that even just that felt like a feat of biblical proportions, but there’s almost nothing that an upcoming trip can’t inspire me to do. Almost being the operative word here, because there will never, no not ever, be a trip with a promise persuasive enough to convince me: (1) that it’s natural for giant metal birds loaded down with diesel fuel to hurl themselves into the sky and fly above the clouds, or (2) that eating a cold salad everyday for lunch is enjoyable. Flying is scary no matter what statistics say, so no getting around that (hi Xanax, sponsor me lol). But leaves for lunch everyday? That’s not a thing, or at least it doesn’t have to be. Especially not when we have salads like this one that don’t have a thing to do with lettuce. In a large bowl - or right on the sheet pan - toss the squash with the garlic, allspice, olive oil, and some salt and pepper until all pieces are evenly coated. Bake for 15 to 25 minutes, or until soft. Remove from the oven and cool. To assemble the salad, combine the squash, chickpeas, onion, and cilantro in a mixing bowl. 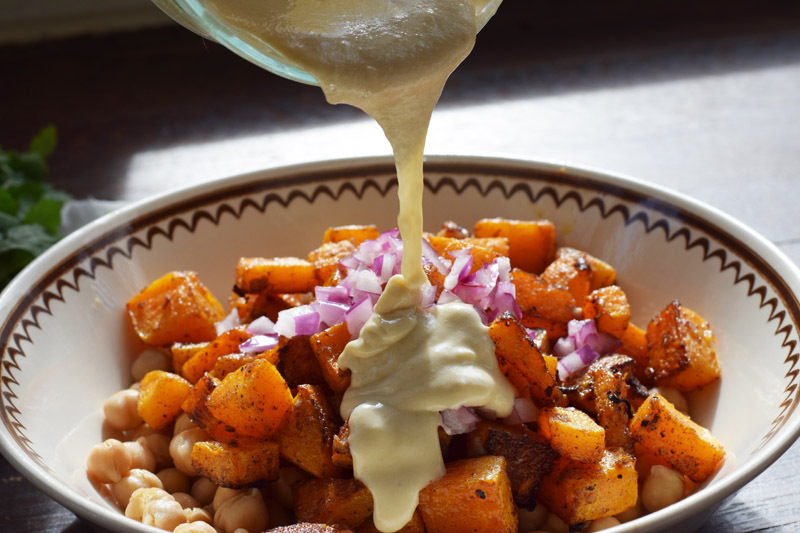 Add tahini sauce to taste, and toss gently. Give a final taste and adjust the seasoning as needed.